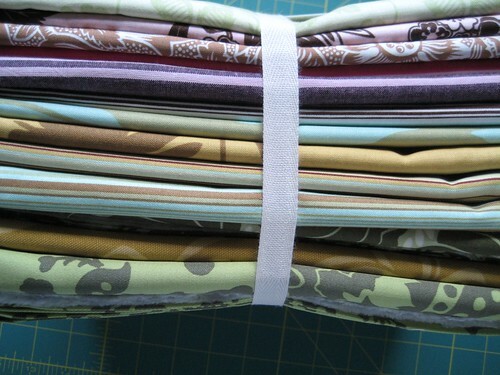 Many sewing (and especially quilting) sites talk about setting a budget and sticking to it. This is something at which I’ve never been much good, but I can see why it’s a big necessity with this hobby – it’s too, too easy to go absolutely hog-wild with fabrics. There are so many out there! And I love them! And I must have them! And they Cost Money! 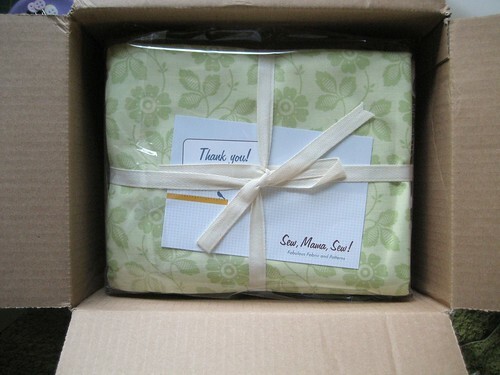 I hadn’t bought much in the last couple of weeks, being good and all, but… then I stopped sleeping for a week. Wrapped in plastic for protection against any wetness, the precious bundles make their way from the SMS home office to me. Bringing with them a happy dance waiting to happen. 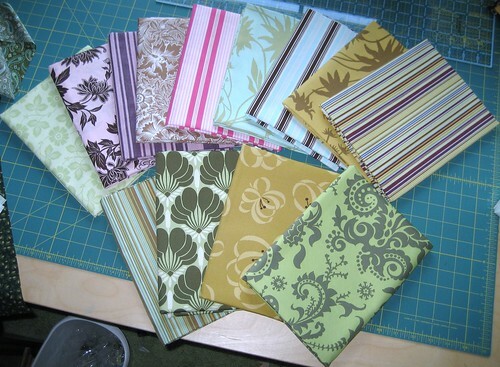 All of them were on clearance, and most were only $4.50 per yard – neato! I only got one yard of each, though, so I reined myself in a bit. Apparently, I was in a stripey mood – although I generally am. I find myself drawn to stripes of all kinds. Also, I seem to be getting over my Pink Phobia… although I’m not really sure I want to. My aversion to pink has nearly been a defining personality feature… alas. I suppose we all grow and mature. Can’t wait to see what else is coming in the mail! I see something on its way from Connecting Threads is on its way, as well, and they have some really cool stuff. Their new Sweet & Sour collection has some truly spectacular stuff. That’s a fall version, of course, but I like the big patches that will show off the colors and patterns. Also, it won’t be Hugely Fussy. 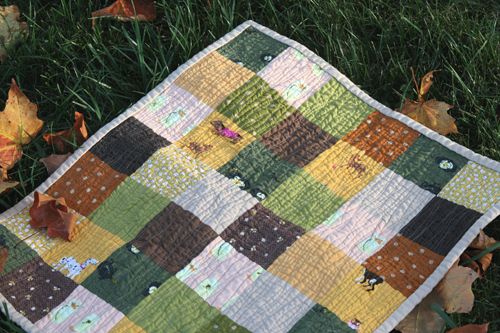 I’m not sure if I like the random, wavy quilting stripes, but that part’s optional. Clicking on that image will take you to the creator’s blog post about it. And the projects filling my brain, holy cow – I can’t wait to get to them! Sewing and quilting both. Another sage piece of Barbara Wisdom – if I want to start quilting, I have to stop making bags! Well that’s a good point, if ever I have heard one! Ok, break’s over – back to work with me. More posts coming soon.